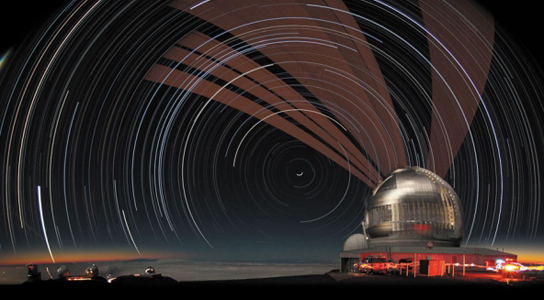 Together, the twin telescopes of the Gemini Observatory, which consists of two 8.1 m (27 ft) telescopes in Hawaii and Chile, provide almost complete coverage of both the northern and southern skies and have been lauded among the largest and most advanced optical and IR telescopes available to astronomers. However, in recent years, it has lagged in scientific productivity, as money was wasted on ambitious projects which never came to term. Last week at the American Astronomical Society in Austin, Texas, Frederic Chaffee, who was drafted out of retirement to become Gemini’s interim director less than a year ago, showed off results from new instruments. The turnaround is good for astronomers and the seven nations backing Gemini, the US, UK, Canada, Chile, Australia, Brazil and Argentina. 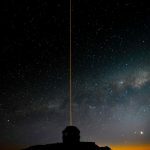 Some of these nations have already made plans to exploit Gemini’s multi-conjugate adaptive optics system (GeMS), an instrument that was unveiled at Gemini South last December. Adaptive optics have been used at large ground-based telescopes to correct image distortions, which are caused by the motion of the Earth’s atmosphere. They use a bright guide star or backscattering from a laser beam fired by the observatory to measure these disturbances. Then, they rapidly change the shape of the mirror to correct them. Until now, it has only been possible to correct a small field of view of the telescope in question. Thanks to its 50-Watt laser, split into five distinct beams, Gemini has managed to correct its sharpness 10 times more than any other system. It will allow astronomers to bring nearby objects, such as galaxies, into focus all at once. Gemini South also unveiled its spectrograph in December, which will allow astronomers to calculate the distances to some of the Universe’s most remote objects, like quasars and the event horizons of the black holes contained in luminous cores of faraway galaxies. Gemini has also received a software overhaul. It’s hoped that this new technology will rekindle an interest by the backing nation which brought Gemini online 12 years ago. Be the first to comment on "Adaptive Optics Will Put Gemini Twin Telescopes at the Forefront of Astronomy Again"